Follow Freda @myburntorange on Instagram to see daily photographs of tantalising dishes. Ghanaians love okra or okro stew. More often than not, okra stew is served along side a slightly fermented stiff porridge known as banku, however it can be served with anything you like. I once tried it with millet and throughly enjoyed the resulting meal. Okra stew looks complex, but it is so simple and delicious. To top it off, it is a very quick and easy dish to make. I love to use fresh ingredients when making the stew, and I do not cook it for very long at all; there is no need to complicate it. Okra stew can be made in a variety of ways and even with an assortment of meats. 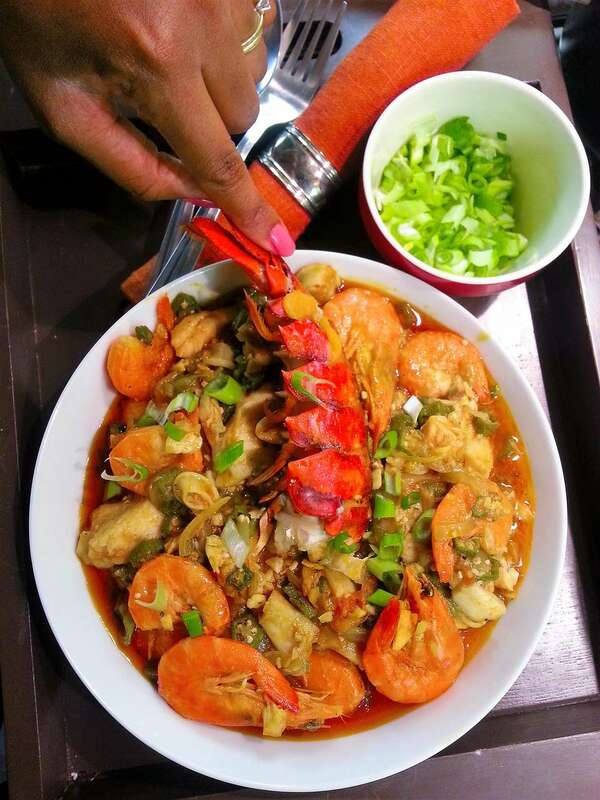 I particularly love okra stew with seafood. Any type of seafood. Fish such as salmon or tilapia cooks in such a short time that you could actually create a lovely and simple meal in 15 minutes. To give okra stew it's traditional flavour, the use of sustainably sourced palm fruit oil is a must. The combination of palm oil, fish and tomato yields a very unique flavour that can be distinctly linked to Ghana. The red palm oil, rich in carotenoids, also adds a vibrant colour to the dish. In terms or texture and consistency, this stew can be made quite runny and can appear to be more of a soup. I do not particularly enjoy okra when it is too slimy, therefore when I chop it up, the pieces are not too small and the cooking time is kept to a minimum so long as the okra is cooked and tender. You may serve this with a variety of carbohydrate rich sides, although you will most enjoy eating okra stew with something which can soak up all the lick-worthy sauce. Try serving the stew with polenta or semolina, and it you are already accustomed, then sadza will go perfectly with this stew. Chop the okra pods by slicing them across to create round pieces. These should be about a third to half a centimetre thick. Add the okra to the pot, followed by the prawns, squid and fish. Top up with the stock and stir. Reduce the heat and allow to simmer for 5 to 10 minutes or until the okra is just tender. If you want to make this dish extra impressive, and have the budget for it, get the lobster tails and place them into a baking tray. Place them onto a tray, flesh side up. Place a teaspoon of butter on each tail, then bake in a preheated oven at 220 degrees celsius (or 200 for a fan forced oven). Do you like what you see? Follow Freda @myburntorange on Instagram to see more tantalising recipe ideas.